1. Place the vinegar, lemon zest and juice, honey, chilli and garlic in a large bowl and whisk together. Thinly slice the courgettes and add to the bowl, turning to coat in the dressing. Chill for 10–15 minutes. 2. Meanwhile, cook the broccoli in a pan of boiling water for 3 minutes until tender. Drain and cool under running water. 3. Line a baking sheet with foil, brush lightly with oil and top with the goat’s cheese. Add a drizzle of oil, a grinding of black pepper and scatter over the nuts. Grill under a high heat for 3–4 minutes until golden. 4. Divide the leaves, broccoli and marinated courgettes between 4 serving plates. 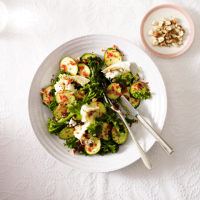 Break the goat’s cheese into pieces and scatter over the top of each salad along with the nuts, and serve. The flavours in this dish would work well with griddled halloumi in place of the goat’s cheese.